To awaken to one’s Catholic conscience is to follow a path of deep yearning and unfolding discoveries. At St. Isidore, we are beckoned to engage in the calling of Christ in our individual lives. Several parishioners, following their own hearts, recently renewed the St Isidore Pro- Life Action Ministry to express and support what tugs at their own heart: the sanctity of life from conception to its natural end. Through the initial efforts of Ken Voelker, who wished to renew the pro-life ministry that had grown less vigorous than in the past, the new Pro-Life Action Ministry was reborn. Separately, Lee Lansford and Bill Tice were concerned with getting the message on the vital importance of life out to all parishioners. 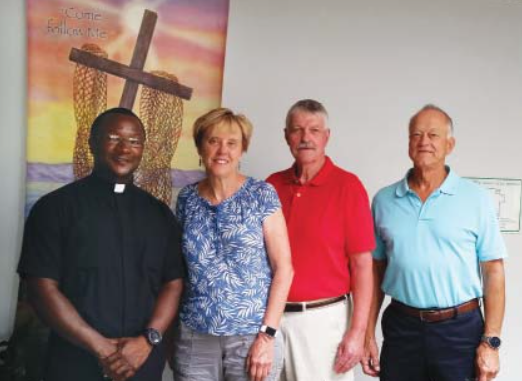 When they discovered their mutual calling, they met in early 2017 to map out this renewed ministry and invite all parishioners into a deeper understanding and action on this issue. Lee credits Ken with breathing new life into the ministry. The group has grown to 15 members. Through prayerful reflection and meeting together, they decided that they would work to bring the pro-life message to the parish in new ways. In their kick-off effort on April 30th, Father Dennis Paul delivered a strong pro-life message. This also raised over $500 which was donated to the Father McGivney Center of Hope & Healing for women who made the decision to keep their babies rather than abort. This talk was the first of what they plan to be an annual event. The group has also stood with the Pro- Life Action League with messages on the sanctity of life and a prayerful presence at clinics where abortion takes place. Be on the lookout for their October event in support of Respect Life month and plan to join in the March for Life in January of 2018 in Chicago. Pro-Life Action communicates with other ministries within the parish on how to engage parishioners further in this message, one so close and vital to our Catholic conscience. They also enthusiastically invite all parishioners to consider joining them. Lee particularly pointed out that they seek members who wish to work to protect the elderly, sick or incarcerated from unnatural end of life policies.